Lawson was born and raised in Brisbane, and attended St Joseph's College, Gregory Terrace. He graduated from the National Institute of Dramatic Art in 2001. He also spent one year studying improvisation techniques in Los Angeles at The Second City, The Groundlings, ACME Comedy Theatre and I.O. West. His older brother is actor Ben Lawson. In 2003 Lawson was awarded a Mike Walsh Fellowship. 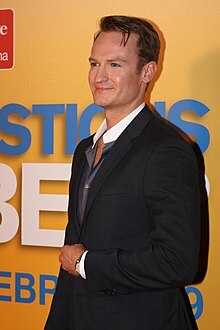 Lawson has had guest-starring roles in such popular Australian television programs as Blue Heelers and Home and Away, and is known for his appearances on the improv comedy program Thank God You're Here and on the Australian dramas Sea Patrol and The Librarians. He also had a guest role in the comedy Wilfred and starred in several television commercials, including advertisements for Coca-Cola Cherry and Gold Class cinemas. Lawson also hosted Wipeout Australia with James Brayshaw. Lawson played Ben in the American pilot Spaced and Shawn on Romantically Challenged for ABC. Since its inception in 2012, he has played management consultant Doug Guggenheim on Showtime's House of Lies. In 2017 he played the title role in Hoges: The Paul Hogan Story. In 2006, Lawson made his feature film debut in BoyTown. He had the starring role in the 2012 Australian comedy film Any Questions for Ben?, created by Working Dog Productions. He also appeared alongside Will Ferrell and Zach Galifianakis in the 2010 comedy film The Campaign, as well as Anchorman 2: The Legend Continues and Crave. His feature directing debut The Little Death which he also wrote and starred in, was released in 2014. Lawson was nominated for an Academy Award for Best Live Action Short Film in 2018 for The Eleven O'Clock, a short film he wrote and starred in. During 2006 and 2007, Lawson was a regular guest co-host on the Australian radio comedy show Get This which aired on Triple M. In 2013, he voiced the role of Bob in the Cartoon Hangover short film Rocket Dog. 1998 Medivac Rob Episode: "Denial"
2006 All Saints Nick Bagnall Episode: "Tough Love"
2006 Nightmares & Dreamscapes: From the Stories of Stephen King ER Doctor Episode: "Autopsy Room Four"
2010 Wilfred Spencer Episode: "The Dog Father"
2012 Lowdown Mark Hardy Episode: "A Bollywood Ending"
2016 Wrecked Eric Episode: "The Adventures of Beth and Lamar"
^ Wigney, James (29 January 2012). "Lawson's ballad about love mimics life". The Sunday Mail. News Limited. Retrieved 15 May 2018. ^ "James Brayshsaw is no wipeout". Dailytelegraph.com.au. Retrieved 16 October 2013. ^ "Josh Lawson". Internet Movie Database. Retrieved 29 March 2012. ^ Schembri, Jim (9 February 2012). "Any Questions for Ben?". The Age. Fairfax Media. Retrieved 17 February 2012. ^ Hipes, Patrick (23 January 2018). "Oscar Nominations: 'The Shape Of Water' Leads Way With 13". Deadline Hollywood. Retrieved 23 January 2018. ^ Roach, Mel. "Rocket Dog". This article about an Australian comedian is a stub. You can help Wikipedia by expanding it. This page was last edited on 21 October 2018, at 18:57 (UTC).